How do you jazz up plain old grilled shrimp?...with an easy and tasty grilled shrimp marinade! I replaced some of the ingredients in this shrimp marinade out of pure necessity. Use what you have on hand, right? I had no tomato sauce, as called for in the recipe, so I substituted ketchup with really good results! 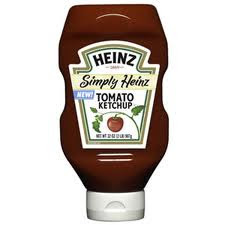 I will tell you, I have been buying Heinz Ketchup with NO HFCS. I really do try to stay away from any products with this ingredient. Besides the controversial health issues surrounding it, I simply think it makes stuff taste fake. IDK if it's in my head or not, but I avoid it whenever I can. I am so happy companies are starting to offer products without it these days. 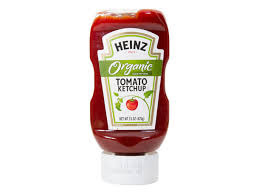 Heinz offers two varieties that are not sweetened with HFCS. Depending on prices and availability, I will choose either variety. It's a very easy marinade to put together with most items already in your kitchen and it gives the shrimp a nice tasty coating. Using ketchup in place of the tomato sauce, makes the marinate nice and thick so it clings well to the shrimp. I'm actually kind of glad I didn't have any tomato sauce afterall! I used my flat metal skewers, but if you use disposable wooden skewers, make sure you soak them in water before you string the shrimp, so they don't burn up on the grill to quickly. *When calculating the nutrition information, I included the marinade stats using the amount left after marinade, which for me, ended up being about a 1/4 of the recipe per serving. The shrimp absorbed very little of the marinade. 1. Combine the garlic, olive oil, ketchup, red wine vinegar, dried basil, black pepper, salt and cayenne in a small bowl. Put shrimp in a gallon sized zipper bag and pour the marinade over it. 2. Put the zipper bag in a clean container and pop into the fridge for 1-2 hours. If using wooden skewers, soak in water while shrimp is marinading. Thread the shrimp onto the skewers, dividing equally between the 6 skewers. 3. Heat grill to med/high. Grill shrimp skewers until shrimp is opaque and cooked through. You can baste skewers with the marinade while cooking if you like. This grilled shrimp marinade helps give the shrimp a kick. Substitute bottled chili sauce for the ketchup for a whole different flavor. Since it uses items most of us have in our pantries, it's easy to put together too! I know I have bombarded you with an abundance of grilling recipes since the weather got warm. What can I say? I loved grilled food!! I do all of the grilling in my house, and I love it. No pans to wash and I get to be outside while I'm cooking. How about you? Do you love grilled foods? Do you do the grilling in your house if you do, or is it someone's else s domain? Don't forget, if you can't go out and grill, you can also make this recipe indoors on the stove in a grill pan and it will be just as delicious. WOW! The shrimp look PERFECT!! Both my husband and I grill, but I think hes better at it than I am!! These look so good! Can you believe I've never tried grilling shrimp? I think I need to change that. Yes! I will definitely be making these! We love shrimp around here. I know my hubs would eat this too, especially being a ketchup fan. I like your skewers too! We love shrimp too...but it doesn't make the table very often because of the price, and for a while there, I could only find the precooked stuff. First thing I had to do after reading this post? PIN IT!!! Need this in my life ASAP. Oh how I love shrimp, and the glaze/marinade is making my mouth water. Oh and I think HFCS makes things taste fake too. Didn't really notice until Dennis started buying Coke (the bottles from Mexico) and Pepsi (throwback) made with sugar and it really is so much better. And I used to let Den do the grilling b/c I didn't get it at first, but now it's mostly my thing and I do it pretty good now! I'm glad I'm not the only one who thinks HFCS tastes fake! Yay for choices these days without it, right? Nice job on the shrimp! Hi, Rene. It's been so long since I've visited, but as usual, you're recipes look divine! I love the shrimp marinade and will have to put it on my list of ideas to try. Looks DELICIOUS Renee!!! I'm a little smitten with the cow skewers too! Have a wonderful Friday!!! I love grilled shrimp. This marinade makes them a beautiful color and I am sure a fantastic flavor! Thanks for stopping by. It's been too long since I've been able to grill. I miss it!